From USA Today and million copy bestselling author J. Robert Kennedy comes Atlantis Lost, the latest installment in the action-packed globe-spanning James Acton Thrillers series, certain to have you on the edge of your seat from page one. If you enjoy fast-paced adventures in the style of Dan Brown, Clive Cussler, and James Rollins, then you’ll love this thrilling tale of archaeological intrigue. Though this book is part of the James Acton Thrillers series, it is written as a standalone novel and can be enjoyed without having read any other installments. 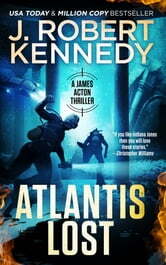 Any of Mr Kennedy's books are like meetig a great friend again. Lots of fast paced action and strong character. I can only wait until the next book comes out to enjoy the next great adventure. Great read! Even though a work of fiction, it taught me a thing or two about the Azores.